As much as I always loved the holidays growing up, I also always dreaded them. I knew that along with all my favorite things — like the hugs and the carols and the twinkle lights — there would also be my greatest demons: the apple pies, the peppermint fudge, and the oatmeal raisin cookies. For my relatives this was a great thing. They loved nothing more than sitting and delighting in each other’s company and good, hearty food. But for me it was hell – because I was in a sea of temptations. I would always start out good. But then over time my willpower would wear down. I would have one nibble. And then another. And another. And soon enough perhaps a whole dessert tray would be gone. I would have eaten a few pounds of sweets. And absolutely hated myself for it. Nowadays, however, I am so happy and relieved to report that this is no longer a problem. Might you happen to need a little – or a lot – of help making that shift yourself? There plenty of diet and health gurus out there who will tell you that the key to “getting through the holidays” is to fast. I tried this for several years. I kept thinking that if I starved myself before big meals, then I wouldn’t feel so guilty if I overate a little bit. When you fast, two things happen to you. One is physical, and one is psychological. Physically, your body sends you a lot of hunger signals. When you don’t eat — and especially as a woman — your body really, really wants you to eat. Psychologically, you begin to develop feelings of deprivation. You are hungry but you can’t eat. You feel deprived. And then you may, like me and like millions of other women, start to obsess over all the things you can’t have. The cookies, the candies, the tarts, the fruit cakes….they start to haunt you. This is not your fault. It is a biological fact. So don’t let yourself fall into this trap. Don’t let the gurus trick you. I change absolutely nothing about my eating in the days leading up to holiday parties or feasts. This has radically improved my ability to have peace of mind and enjoy them. Many diet gurus will tell you that it’s imperative to eat low carb before big feasts. The point is to maximize insulin sensitivity. For one thing – managing insulin sensitivity is a matter of nourishing one’s gut health over a long-term period. For another, a short-term low-carb fix isn’t going to necessarily make any impactful changes. And finally, even if there is any slight different in insulin sensitivity for a meal, it really won’t make a difference in the long run. I find it much more physically and psychologically healthy to just always focus on eating well most of the time. It’s not worth the 20% change in insulin sensitivity for a meal or a few days (if it even happens). It is much better for me too eat a whole range of macronutrients all of the time, and focus on their quality rather than on their quantity. We may all be a lot of things, but one thing none of us are is objective. Your perception of your physique is highly influenced by your psychological context. If you’re feeling guilty, you’ll probably pinch your hips and think “wow, I’m definitely thicker than I was yesterday.” You’ll think this is real. But there is a very good chance you will be wrong. I positively forbid myself from doing anything of the sort. I attempt to do this in my every day life, of course. But I do get more serious about it over the holidays are special occasions. I exercise on a reasonably regular basis. Usually this entails dancing, but I do lift weights from time to time. All of these things are good and important and healthy. They support healthy insulin resistance, healthy brain function, and healthy bones, lungs, and hearts. I work out during the holidays if I feel like it. If I don’t, I don’t. Exercise is a part of a long-term plan in life that can wax and wane based on your needs for flexibility. Sure, you might be in a “calorie deficit” if you work out on Christmas morning… but who the hell wants to work out on Christmas morning? It’s fine if you don’t. The world won’t end. Nothing will happen to me, or to you, in the long run if we let ourselves be flexible over the holidays. Something that’s very interesting to me about body image and food issues is how selfish they are. This is not to say that they aren’t very real and very important things that need to be dealt with. But they are also very much within ourselves, within our own hearts. Throughout my entire life, I try to remind myself that the quality of my life, my goodness in the world, and my relationships are the most important things. My self-respect and love most certainly matters… so much… but it is much easier for me to love and embrace my body when I think about it as the vehicle in which I have the capacity to love, rather than the idol that I need to worship and prevent from being judged. During the holidays, when I focus on loving, supporting, hugging, and laughing with the people around me, I don’t have issues around food. I don’t worry about how much eggnog I drink. Instead, I feel loving and warm. So this is it! I hope it helps. 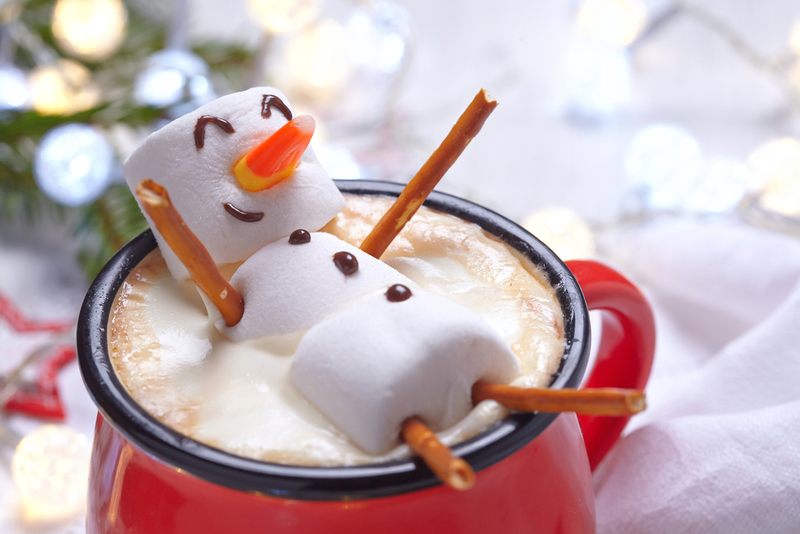 🙂 What do you do during the holidays to make it through feeling safe and warm? If you’re looking for some extra emotional support over the holidays, check out two of my favorite body image and love books: Why Weight and When Food is Love, both by Geneen Roth. If you’re looking for a self-loving way to maintain a healthy weight after the holidays, check out my guide designed to help you do just that: Weight Loss Unlocked.